SWRCB contends Gallo used Russian River water to create this 8-acre reservoir near Healdsburg. San Rafael, Calif. -- A third consecutive dry year is heating up debate about water resources in California's North Coast vineyards; agriculture in general and the winegrape industry in particular are seeing increased official and public scrutiny of their water-use practices. A recent article in a Mendocino newspaper cast light on the controversy. Addressing "struggles with lack of water for agriculture," the Ukiah Daily Journal described a historical anomaly (or governmental misstep) that gives most of the water in the Lake Mendocino reservoir to Sonoma County, forcing Mendocino's Redwood Valley to purchase water from the Sonoma County Water Agency (SCWA). The article drew numerous reader comments, most of them vehemently hostile toward the grapegrowers who comprise Redwood Valley's largest industry, contributing an estimated $30 million annually to the local economy. One anonymous commenter from Illinois stated, "This is not the correct area to grow winegrapes. Too cold and too hot…Let them suffer the consequences….Save the water for households and small food producing gardens." A Ukiah reader logged in as "Wine Isnt Food" (sic), agreed: "It's their own fault for being greedy and trying to grow grapes in areas that are not fully suitable…they all knew the water situation when they planted the vineyards. Turn off the water!!! Wine is not food." Reader "Wine Is Food" stood up for the growers, pointing out that, "One of the main reasons we retain a rural/ag character is because of winegrapes. Wineries do provide sustainable jobs. Mendocino County has the highest percentage of organic winegrapes of any county in the state. Most grapegrowers are conservationists, and do try to limit water usage. Most use sustainable practices." Gallo has not formally responded to the allegations, SWRCB director William L. Rukeyser told Wines & Vines today. Should the company choose to contest the order, he explained, it must appear before a panel of board members, who will serve as a jury. Should Gallo lose this hearing, it could appeal in civil court, where it would face possible penalties of $500 for each day it was in violation of state regulations, an amount totaling some $547,500, according to the complaint. 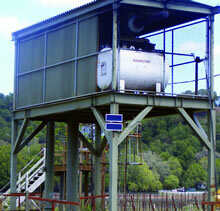 The California State Water Resources Control Board (SWRCB) contends that E. & J. Gallo used this pump house to divert Russian River waters for vineyard use. Rukeyser said that for the past three, water-scarce years, SWRCB has been paying close attention to the Russian River Valley, comparing current aerial surveys with maps and charts of long-established watercourses. The board is also keeping a close eye on the San Joaquin Valley and the Central Coast, he said. Although no similar complaints are on the books now, he said, "Anecdotally, there is a lot of talk in the Russian River area, especially about diversion. The Russian River is one of the areas hardest hit by the current drought. Normally, water rights are an obscure area of California law. In drought years, it fascinates everyone." Water law is highly complex, Rukeyser said. He explained that unlike most Western states, California law regulates only surface water sources, not groundwater. If you own property with a legitimate water right, you may use stream water from a natural watercourse adjacent to your property, but only for specified purposes, at specified times, and only at the specified site. And you can't drill a well six feet from the stream. 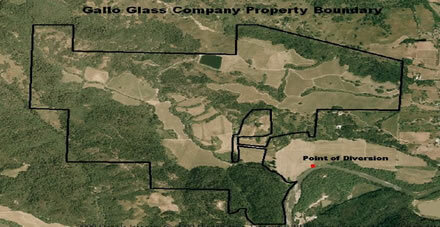 "Gallo has water rights for this property, as I recall," he said. "The issue here is place of use and type of use. The allegations here are that the company took a previously existing, quite small stock pond, and expanded it to be a fairly substantial reservoir, then diverted river water--for which it didn't have a right--to store there." Gallo has filed paperwork to regularize the reservoir, but according to Rukeyser, this has not yet been approved. SWRCB documents deviations in water diversion by comparing aerial photos with maps of established water rights use. Susan Hensley, Gallo vice president, strategic planning and public relations, said in an e-mail, "We have been working with the state to resolve this issue and filed the appropriate documents earlier this year with the State Water Resources Control Board. We have since taken corrective actions to address their concerns. We are changing our existing water rights to benefit fish resources in the Russian River watershed by diverting water during high flow periods to an off-stream reservoir to reduce direct pumping from the river during the summer months." Although Sonoma businesses and residents have been asked to meet a mere 25% water conservation goal this year--compared with a dire 50% mandate in Mendocino--the county is taking measures to mitigate the crisis. It has invested about $70,000 in two vineyard water conservation demonstration projects at Hoot Owl Creek/Alexander Valley Vineyards (avvwines.com), which will monitor and compare irrigation methods and low-volume vineyard cooling. The county water agency is working with vineyard consultant Dr. Mark Greenspan of Advanced Viticulture LLC, who will oversee the projects. Greenspan said equipment will be installed next week, and that live updates will be available online at his website advancedvit.com and the water agency's sonomacountywater.org. The irrigation demo will show side-by-side comparisons of "just a few rows," Greenspan said, one with two .5gph emitters and the other with a single, 1gph emitter per vine. Soil moisture measuring devices will monitor wetting depths. Another comparison will show differences between longer, less frequent and shorter, more frequent irrigation cycles. Other experiments will measure two levels of deficit irrigation and daytime vs. nighttime irrigation. Vines will be carefully observed throughout the growing season for stress and fruit characteristics. The 3-acre low-volume vineyard cooling project will trial various techniques for cooling grapes using less water, including a new product that will "mist" the vines. This project is an offshoot of a previous trial at Napa's Beaulieu Vineyards. In addition to their online presence through harvest, the two plots will be open to the public at least twice during the projects. These demonstrations are tentatively scheduled for July 9 and Aug. 13. Greenspan said, "We're hoping this will not be just a one-way street. We hope to get other growers to come and talk about their experiences. We want this to be a conversation starter." Some equipment has been rented, and much has been donated by suppliers including Ranch Systems, Crossbow EKO Systems, Aqua-Spy, Jain Irrigation; Alexander Valley Vineyard is contributing the use of the site and much of the required labor, in addition to use of its cash crop. Bruce Sherwood, SCWA public information officer noted that the past week's unseasonal May rains have not reduced the urgency of the North Coast water situation. "We got only 1,100-acre-feet in Lake Mendocino; literally, a drop in the bucket," he said. He noted that utility of the Russian River watershed is divided: about one-third is consumed by agriculture, one-third by the urban population and the final third by fish and recreation. "We recognize that agriculture is an enormous part of our economy, "he said. "Winegrape sales alone bring in $400 million a year to our economy, and winegrapes are our top agricultural producer." These huge vineyard owners are taking precious resources from our environment, hiring illegal workers and taking much of the money gained from OUR resources OUT of our area. This is a lose loseloseloselose situation every time all day, yet because they play this "farmer" card, we somehow allow it. It's wrong. If they want to pull water up from the wells, MAKE THEM PAY for every gallon that comes out of Ag wells.